Today, neither the press nor government has the authority to validate little Virginia's belief in miracles. 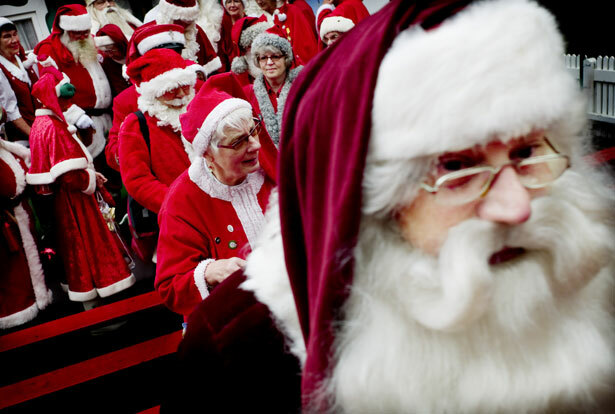 It is easy to see the modern Santa Claus as a symbol of unrestrained commercialism and as little more than a dangerous myth driving us deeper into debt despite national economic insecurity and widening inequality. But since the turn of the twentieth century, believing in Santa Claus has also been a litmus test of Americans’ faith in our own institutions. Fifty years after the Sun assured Virginia of Santa’s existence, the United States Postal Service served the same purpose in 1947’s Miracle on 34th Street. At the film’s climax, Santa’s attorney, Mr. Gailey, proves that Kris Kringle is Santa Claus by showing that the post office delivers Santa’s mail to him. Gailey waxes eloquent about the history and scope of the USPS, getting the prosecutor to concede, “Your honor, the State of New York is second to none in its admiration of the post office department. It is efficient, authoritative and prosperous.” Having established the post office’s authority, Gailey argues, “Every one of these letters is addressed to Santa Claus. The post offices deliver them. Therefore, the post office department, a branch of the federal government, recognizes this man, Kris Kringle, to be the one and only Santa Claus.” The judge agrees. Santa’s existence and identity are confirmed because post office authority is established through the collective faith of the people in this agency of the federal government. In 1897 there is a Santa Claus because the Sun says so. American print journalism enjoyed authority such that an unsigned editorial could verify the existence of a mythical being. In 1947 there is a Santa because the post office delivers his mail. At midcentury the will of the people is verifiable through its faith in its government agencies. In 1994 the collective faith of the American people rests firmly in its financial system, printed on its money. Imagine American media declaring Santa’s existence today. Any such editorial would be PoliFacted, Drudged and Daily Kosed to shreds. Postal workers are less likely to be portrayed as heroes, and more likely to be sitting on Santa’s knee hoping for a miracle to save their own shrinking ranks. The recession, jobless recovery and credit downgrade ensure that American currency is no arbiter of collective will. Americans no longer trust Congress or the president, so neither institution could simply declare Santa’s existence by law or executive order. To whom would Virginia turn today to verify the claim of Santa’s existence? Not the press, the government or the financial system. As our ideological, partisan and identity differences grow, we lose an ability to adjudicate our collective claims. The 1994 version of Miracle on 34th Street has a visual montage of belief, shot over the swelling music of a gospel choir. Shubert Theater Believes reads the marquee of the historic nonprofit theater; Iron Workers Local 542 Believes hangs from a bridge; 7-Up Believes reads a billboard; Irv and Joann Believe is chalked on a cafe menu board; Teamsters Local 237 Believes is scrawled on the side of a dirty truck; City Workers, We Believe flashes on a traffic sign; GOOD YEAR: We Believe! blinks on the blimp; and a young girl asserts Rebecca Believes on a poster in her apartment window. In 2011 what do nonprofits, small businesses, city workers, unions, major corporations and kids all believe?